Sydney’s residential property market has sunk to a new low, with auction clearance rates likely to be revised down into the 30 per cent range after a dire weekend for vendors. Nationally, the preliminarily auction result was 47 per cent, with Sydney’s preliminary rate at 44.5 per cent, but Domain chief analyst Nicola Powell said the trend clearly indicated the figures would end up much lower, and that there would not be any improvement before the year is out. “I think this is what we are going to see for Sydney for the rest of the year,” she said. Dr Powell said it would likely continue into next year. “Once we see the full report from the royal commission into banking there will be a further tightening of lending and further deterioration of prices,” she said. Analyst Louis Christopher noted that there had only been three previous occasions when Sydney auction clearance rates hit the 30 per cent range – November 2008 in the global financial crisis, May 2004, when NSW introduced vendor stamp duty, and July 1989, when the cash rate hit 17 per cent. Home prices in Sydney are down 6.1 per cent from their peak this time last year. In Melbourne, results were not much better, coming in at 48.6 per cent. The most expensive home sold in Melbourne over the weekend was a four-bedroom terrace house at 213 Beaconsfield Parade, Middle Park, for $5.3 million. There was only one bid from the crowd of 40 people. Selling agent Grace Le-Francke from real estate agent Wilson said the result was expected. “But you only need one buyer to get a result,” she said. The grim results, where fewer properties were auctioned and a higher proportion withdrawn, saw just $160 million worth of homes sold in Sydney over the weekend, down from $485 million at the same time last year. The evidence is also feeding into house price predictions, with Morgan Stanley and AMP Capital worsening their forecasts in the last fortnight. Morgan Stanley, which has revised its outlook downwards amid weakening economic signals, expects home prices could fall by as much as 15 per cent peak-to-trough, citing tighter credit conditions. AMP Capital cut its outlook for the housing market to predict a peak-to-trough decline of 20 per cent in Sydney and Melbourne, based on the persistently low auction clearance rates, along with tighter credit and the prospect of reduced negative gearing and capital gains tax deductions for property investors under a federal Labor government. Nationally, CoreLogic reported that there was an increase in auction volumes over the week with 2119 homes auctioned across the combined capital cities, up from 1851 over the previous week, although lower than this time last year (2519). CoreLogic noted that preliminary results showed a clearance rate of 49.8 per cent across the combined capital cities for the full week, up from 47 per cent last week, but lower than the 64.7 per cent achieved at the same time last year, marking the fourth consecutive week where the clearance rate has been below 50 per cent. While it is harder for agents to sell, there are still some surprisingly good auction results driven by the owner-occupier market. A three-bedroom, two-bathroom home at 4 Carlow Street, North Sydney, sold at a Saturday auction for $2.48 million, $30,000 above reserve. 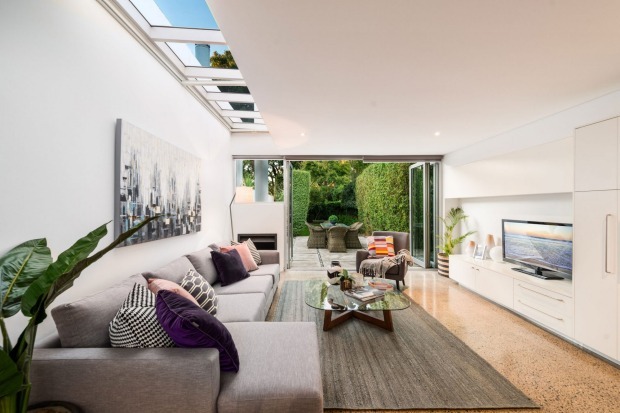 Selling agents Belle Property Neutral Bay co-principal, Mark Jackson and agent, Christian Percuoco, reported five registered bidders, with three participating in the bidding from a starting point of $2.1 million.